Rare Care, along with faculty and graduate students at the University of Washington’s School of Environmental and Forest Sciences, wrapped up a multi-year study on the federally-endangered showy stickseed (Hackelia venusta). The study was funded by the US Fish and Wildlife Service to support recovery efforts for the species by developing a better understanding of its habitat requirements and by improving propagation techniques. Regina Wandler is a graduate student in the Master of Environmental Horticulture program, within the University of Washington’s School of Environmental and Forest Sciences. For her masters project, she is working with UW Botanic Gardens to develop a continuing education program for restoration professionals in the Pacific Northwest. Regina grew up in Everett, WA (pretty local!) and went to UW for her undergraduate education as well. What to do about muddy puddles caused by rain runoff in the middle of a trail used by hundreds of people every day? Could a garden solve the problem? UW graduate student Nicolette Neumann Levi is looking for ways to bring more native pollinators to the UW Farm. This past April the Camellia area of the Washington Park Arboretum was paid a scientific visit by UW SEFS professor Dr. Darlene Zabowski and students from her Advanced Soil Genesis and Classification course (SEFS 513). 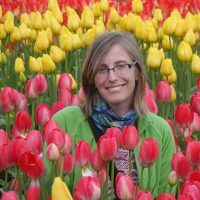 Eve Rickenbaker, Graduate Student as well as Hyde Herbarium Collection Manager, is the recipient of The John A. Wott Fellowship in Plant Collection and Curatorship for 2014. UW Information School graduates researched and designed a mobile app to enrich the experience of Arboretum visitors. Team member Sarai Dominguez reflects on discovering visitors’ information needs . Leveraging the recently developed interactive map of the Arboretum’s plant collection UW Information School graduates researched and designed a mobile app. Team member Loryn Lestz shares her experience. It was the first quarter of my freshman year at the University of Washington. I was enrolled in an environmental studies class, and we, the students, were given an option between doing a book report and volunteering for “service learning.” Man, was I glad I chose to volunteer, because my time at the arboretum was great.